The Player formally known as “Chad Johnson” get his wish! As you all may recall, Ocho Cinco AKA Chad Johnson had attempted to wear a jersey with the name “Ocho Cinco” last season, only to be stopped by league officials. 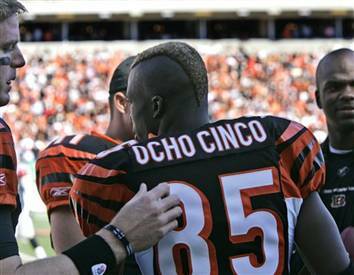 The NFL fined Chad hundreds of the thousands of dollars over the issue, so Chad made the decision to legally change his name to “Ocho Cinco” in hopes of recovering any and all lost funds and gaining the ability to wear the Nickname on his back. So in August Chad went to Florida and changed his name. The NFL however was not happy and decided to tell the receiver that he would have to pay for the large inventory of already stocked “Johnson” jerseys that Reebok produced for last season, citing that these jerseys would be too tough of a sell . The receiver declined, choose to play the season under his old name. But this year is a completely different story! The NFL has decided to allow Ocho Cinco to wear his new jersey as long as it is “Ochocinco” which is legally how he spelled it, when he changed his name in Florida last august. League Officials probably see this as a way of getting back at Ocho for his act of defiance, either way I still think he is one of the coolest WR in history. So make sure you get out there and buy a piece of NFL history and stock up on your OCHOCINCO jerseys now, while supplies last!